A £100m build to rent tower on the banks of the River Clyde has been cleared to begin construction in the third quarter with the award of planning consent for the 498-apartment project. Platform_ filed for permission in September last year for four blocks of accommodation ranging in height from six storeys up to 20 which will also house a mix of co-working spaces, a shared residents lounge, concierge, roof terraces, gym and games room. 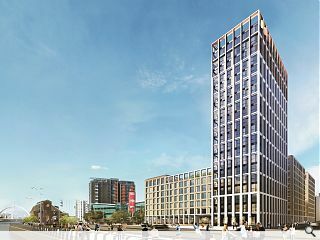 Keppie have led the design on the project as part of their wider Central Quay masterplan, which will deliver 300,000sq/ft of office space, a 150-room hotel and further housing. Matt Willcock, development director at Platform_, commented: “We’ve been working closely with architects, designers and members of the city council over the last few months on the Central Quay site and are pleased to have received approval for the development. Completion of the project is expected by 2021. I'm sure the roof terrace will have lovely views of the kingston bridge, strangely enough just out of shot! @roof- And of glasgow uni tower, park circus, the hydro, science tower, the spires of kelvingrove, much of the city centre, the new developments going up at tradeston, laurieston, clyde street, probably even templeton and peoples palace and a fair bit pollokshields and govanhill up to queens park! I think it would be a fantastic view. This building is too tall! Glasgow needs more city centre residents! Who'd want to live in the city centre?! Glasgow needs more affordable housing! This housing isn't affordable enough! Glasgow needs to rejuvenate the riverside! Who'd want to live beside the river?! The comments on Glasgow projects make Brexit look easy. City centre living suits a lot of people. So the more choice the better. In my younger days there was little choice and I would have loved that choice at that time of my life. No matter which city it is there will always be noise pollution and some ugly views. Kingston bridge aside the other landmarks are well worth a view. Great to see the gaps on the Clyde filling up. And some height too!